The post-season has arrived for students in speech and drama. As a team, the Columbus speech competitors brought home a second place trophy behind Loyola, a powerhouse that specializes in speech events. 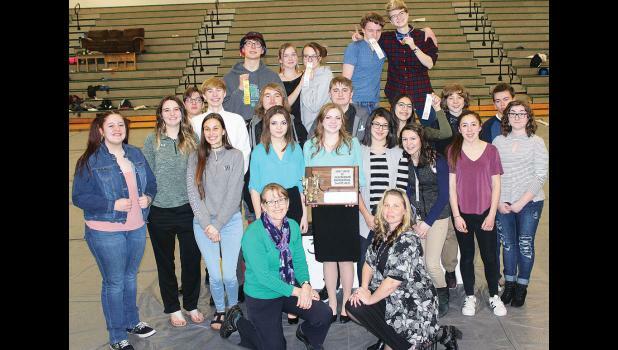 Last Saturday, more than 200 competitors from Class B and Class C schools from around the state came to Columbus to show their stuff at the divisional speech and drama meet. Each student had the same goal – to finish in the top-eight of their event to punch a ticket to the state competition. Twelve students on the Columbus team achieved this goal. On Saturday, junior Susan Carrel took first in dramatic oral interpretation for the fifth time this season. The only two meets in which Carrel did not place first were Class A, and so involved competitors that will not take part in the Class B-C state meet next weekend. Junior Kolton Gladney placed third in memorized public address, and senior Josiah Forseth earned fourth place in spontaneous oral interpretation. Akira Castanon, a senior, also made it to state in dramatic oral interpretation, placing fourth. Rounding out the speech team was junior Adrian Cook with a fifth place finish in impromptu. Four drama acts performed well enough to earn a place on the big stage. Dramatic duo Heather Richardson and Ashton Zwetzig, a senior and junior, respectively, finished in third. Two dramatic solo competitors will be traveling to state – freshman Leslie Richardson placed third, and junior Coleson Grewell finished in eighth. Senior Shadlynn Summers earned sixth place in humorous solo. The Columbus policy debate team – senior Alli and sophomore Riley Onoszko – placed third, and will be competing in the final meet of the season. Next Friday and Saturday, the state meet will be held just down the road in Huntley.